I recently downloaded Xcode 5 DP to test my apps in iOS 7. The first thing I noticed and confirmed is that my view's bounds is not always resized to account for the status bar and navigation bar. This results in my content appearing below the navigation bar and status bar. I know I could account for the height myself by getting the main screen's height, subtracting the status bar's height and navigation bar's height, but that seems like unnecessary extra work. This will fix the view from being framed underneath the navigation bar and status bar. However, I have not found a fix for the case when you want the navigation bar to be translucent. For instance, viewing a photo full screen, I wish to have the navigation bar translucent, and the view to be framed underneath it. That works, but when I toggle showing/hiding the navigation bar, I've experienced even stranger results. The first subview (a UIScrollView) gets its bounds y origin changed every time. You need to add the above in your -(void)viewDidLoad method. iOS 7 brings several changes to how you layout and customize the appearance of your UI. The changes in view-controller layout, tint color, and font affect all the UIKit objects in your app. In addition, enhancements to gesture recognizer APIs give you finer grained control over gesture interactions. In iOS 7, view controllers use full-screen layout. At the same time, iOS 7 gives you more granular control over the way a view controller lays out its views. In particular, the concept of full-screen layout has been refined to let a view controller specify the layout of each edge of its view. The wantsFullScreenLayout view controller property is deprecated in iOS 7. If you currently specify wantsFullScreenLayout = NO, the view controller may display its content at an unexpected screen location when it runs in iOS 7. The edgesForExtendedLayout property uses the UIRectEdge type, which specifies each of a rectangle’s four edges, in addition to specifying none and all. 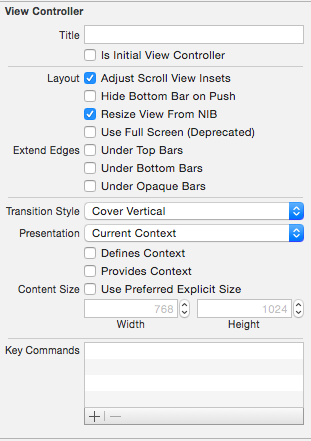 Use edgesForExtendedLayout to specify which edges of a view should be extended, regardless of bar translucency. By default, the value of this property is UIRectEdgeAll. The topLayoutGuide and bottomLayoutGuide properties indicate the location of the top or bottom bar edges in a view controller’s view. If bars should overlap the top or bottom of a view, you can use Interface Builder to position the view relative to the bar by creating constraints to the bottom of topLayoutGuide or to the top of bottomLayoutGuide. (If no bars should overlap the view, the bottom of topLayoutGuide is the same as the top of the view and the top of bottomLayoutGuide is the same as the bottom of the view.) Both properties are lazily created when requested. You don't have to calculate how far to shift everything down, there's a build in property for this. 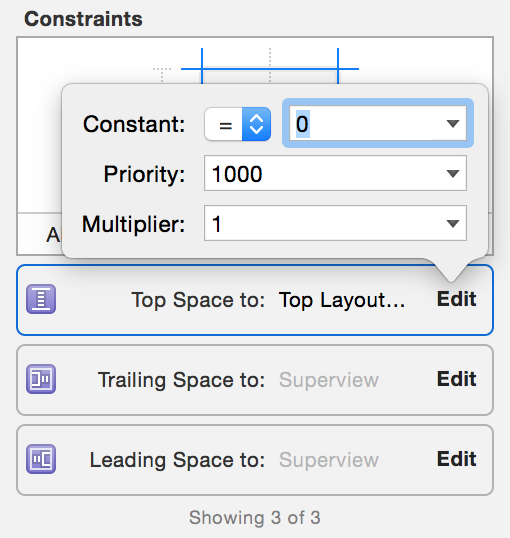 In Interface Builder, highlight your view controller, and then navigate to the attributes inspector. Here you'll see some check boxes next to the words "Extend Edges". As you can see, in the first screenshot, the default selection is for content to appear under top and bottom bars, but not under opaque bars, which is why setting the bar style to not translucent worked for you. As you can somewhat see in the first screenshot, there are two UI elements hiding below the navigation bar. 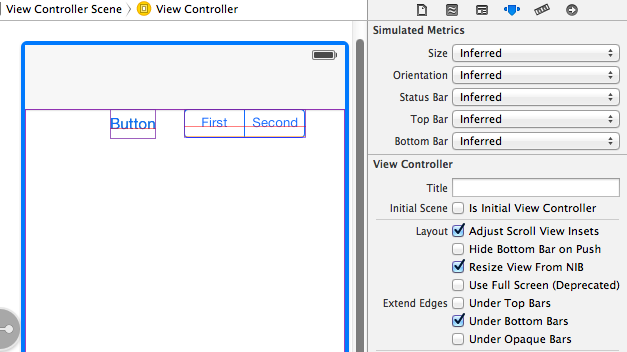 (I've enabled wireframes in IB to illustrate this) These elements, a UIButton and a UISegmentedControl both have their "y" origin set to zero, and the view controller is set to allow content below the top bar. This second screenshot shows what happens when you deselect the "Under Top Bars" check box. As you can see, the view controllers view has been shifted down appropriately for its y origin to be right underneath the navigation bar. Source (in topLayoutGuide section at bottom of pg.39). If you want the view to have the translucent nav bar (which is kind of nice) you have to setup a contentInset or similar. 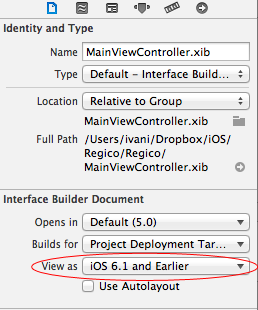 In your apps plist file add a row, call it "View controller-based status bar appearance" and set it to NO. I would like to expand on Stunner's answer, and add an if statement to check if it is iOS-7, because when I tested it on iOS 6 my app would crash. I have a scenario where I use the BannerViewController written by Apple to display my ads and a ScrollViewController embedded in the BannerViewController. To prevent the navigation bar from hiding my content, I had to make two changes. Now the ads show up correctly at the bottom of the view instead of being covered by the Navigation bar and the content on the top is not cut off. just set the following code in view will appear. I had the same issue with my app by iPads (armv7, armv7s, amr64) only by presenting another UIViewController and after dismiss them goes nav bar under status bar... I spend a lot of time to find any solution for that. 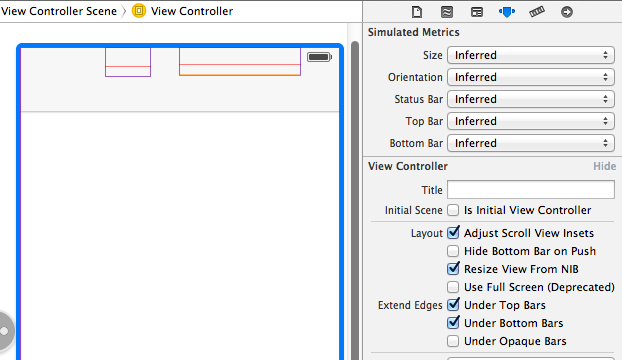 I'm using storyboard and in InterfaceBuilder for UIViewController which makes terrible i set Presentation from FullScreen -> Current Context and it fix this issue. It works in my app only for iPads => iOS8.0 (testing with iOS8.1) and for iPads with iOS 7.1 not work!! 1.Go to your application info.plist file. 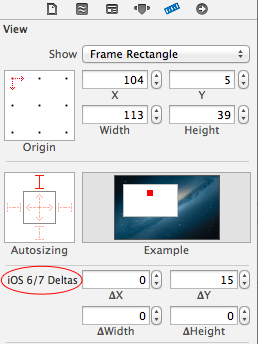 Interface Builder: What are the UIView's Layout iOS 6/7 Deltas for? What are the benefits of using Storyboards instead of xib files in iOS programming? Navigation bar jumps out from under status bar?